The global trade in arms was turned on its head by the end of the Cold War. Now an analysis of the network of arms trading has revealed other disturbing trends. The Stockholm International Peace Research Institute is a world-renowned think tank that focuses on conflict, arms control and disarmament. Each year, it gathers data on the international transfer of major conventional weapons across the globe. These include aircraft, armoured vehicles, naval vessels and so on. The resulting database provides a detailed picture of the international flow of arms. And a wide variety of organisations and researchers have used it to study the nature of the international arms trade. This data provides a clear picture of the major arms exporters, the major arms importers and the value of this flow. But arms sales depend on other geopolitical factors such as the wealth of the countries involved, the conventional trade between them, the similarities in their internal politics and even the distance between buyer and seller. But exactly how these factors influence the arms trade is poorly understood. Today that changes, at least in part, thanks to the work of Michael Lebacher and Göran Kauermann at the Ludwig Maximilian University of Munich in Germany. These guys study a wide variety of geopolitical links between countries and how they correlate with the trade in arms. The result is a network-based analysis that reveals some of the complex factors at work and how geopolitical factors have turned the arms trade on its head since the end of the Cold War and the collapse of the Soviet Union. The researchers begin with data that lists the arms trades between some 200 countries from 1950 and 2016. They use this to map out the arms trade network in which countries are nodes and links exist between them if they trade arms. These links reflect both the magnitude of the trade and its direction. That immediately reveals obvious clusterings. Lebacher and Kauermann use the data from 1952 to visualise the data. It shows that at this time the biggest exporters were the US, Britain, the Soviet Union and Canada. The researchers point out that this this is also when the arms trade network was at its simplest — it has grown in size and complexity since then. They go on to analyse how the arms trade network corelates with the overall trade between countries. This network is dominated by dense clusters around the US and Britain but also by an almost entirely separate cluster around the Soviet Union. 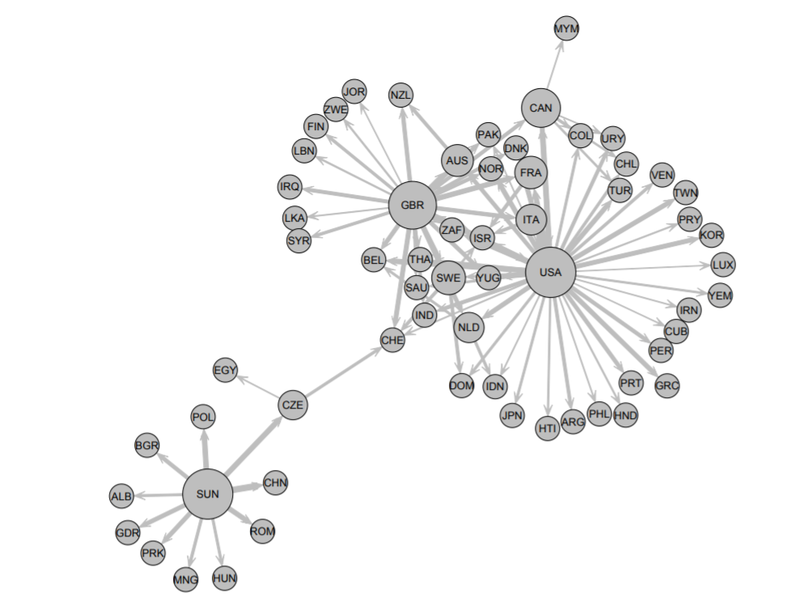 Interestingly, these separate clusters are linked by the trade activity of a single country. “The flows related to Switzerland serve as a bridge between the clusters around the western producers and the Soviet Union,” say Lebacher and Kauermann. But the most interesting work is on how these network correlations change over time. To study this, Lebacher and Kauermann analysed the strength of the correlation between the network of overall trade and the network of arms trade over time. They found that between 1952 and 2016, this correlation was consistently positive suggesting that arms trade between countries is linked to the overall trade between them. But the way this correlation changes over time is interesting too. “The strongest downward movement can be found in the years 1990–1996, showing how massively the end of the cold war altered the structure of the international trade of arms,” say Lebacher and Kauermann. The data also reveals a change in the way arms were traded following the end of the cold war. Prior to this, the arms trade depended on the GDP of the receiving country — in other words wealthier countries bought more arms. But after 1990, this dependency vanished. “Before the end of the cold war, high arms trade flows went to countries with big economic size and after that, high flows are directed more strongly towards countries with high spending for military equipment,” say the researchers. What’s more, the effect of political links on the international arms trade has changed as well. Prior to 1990, having a political alliance made arms trades much more likely. But something strange has happened in more recent times. Since 2011, differences in politics have had much less influence on sales. “Differences in the polity score do not lead to a reduction of the traded amount of arms,” say Lebacher and Kauermann. So countries with political differences have increased their trade arms. That’s interesting work that provides some important insights into the nature of the international arms trade and how it has changed over time. It also provides a template for studying broader changes in international relations where the effect of differences in politics seems to have become less important. And that raises the curious question of how that will play out in the longer term.